Hi-Tech Pushrods with 3/8'' diameter and a .065'' wall thickness are made of high-quality 4130 chromemoly steel heat-treated to a minimum hardness of 60 on the Rockwell ''C'' scale. 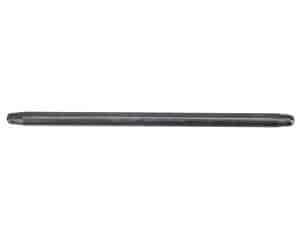 The use of finite element analysis has helped Comp Cams to design this pushrod for superior performance and endurance. Applications include engines employing midrange spring pressures and high engine speeds. Because of their increase in natural frequency, these pushrods help tune the valvetrain when subjecting the valvetrain to its maximum speed. Spintron tests show that this product helps control valve motion, which captures lost horsepower due to valve bounce. They are OD ground for consistency and black-oxide finished with etched length and part number for easy identification.